As with many types of headaches, doctors are unsure about the exact triggers for exertional headaches (also known as exercise headaches). What they do know is that this kind of pain happens during or after continual or strenuous exercise. The kinds of exercise that are particularly associated with exercise headaches include cycling, running, weightlifting, and gymnastics. After exercise, the person usually experiences a throbbing pain on both sides of the head. This pain can start as quickly as five minutes after strenuous exercise or may take up to 48 hours to occur. But what causes this pain? Many people do strenuous exercise every day, but not all of them experience debilitating headaches as a result of sporting activity. One theory is that some kinds of sustained exercise cause the blood vessels in a person’s head to dilate. It’s also thought that particularly strenuous exercise can cause spasms in the muscles in the upper body, neck and head, triggering these kinds of headaches, which can seriously affect a person’s quality of life. However, the good news is that more doctors now believe that focusing on a person’s spine may offer new relief for those who suffer from these kinds of symptoms, believing them to be caused by some kind of damage to the neck and back. Upper Cervical Doctors particularly focus on the top two vertebrae in a person’s neck (the C1 and C2 or atlas and axis). Using a specific upper cervical technique to realign these two vertebrae enables the vertebrae below to work properly. If the top two vertebrae have moved from their correct positions, the lower vertebrae become impaired and unable to function in an optimal state (hence the pain). 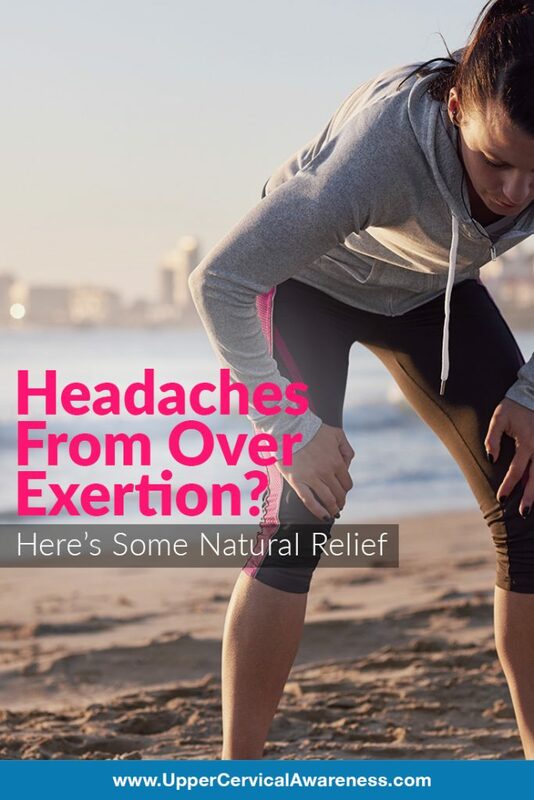 This natural treatment offers patients the knowledge that doing exercise won’t necessarily mean they have to live with long-lasting headaches and rely on medication to relieve the pain of exertional headaches.